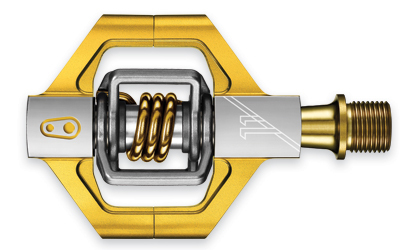 The Crank Brothers Candy 11 features an aluminum body with 4 main parts made of titanium. The sturdy machined aluminum gives you a stable platform to land on and push against, while keeping weight at a minimum. As with all Crank Brothers pedals, it is fully rebuildable and simple to maintain. Crank Brothers recommends a maximum rider weight of 200 pounds (90 kg). Includes a pair of AllAccess cleats that fit SPD bolt pattern, and also includes a pair of brass shims. Weighs 226 grams per pair.